Here are the best cheap radar detectors to help you steer clear of speeding tickets. Traffic violation fines can be quite hefty. However, with these budget radar detectors on the market you can dodge these radars without spending a fortune. Law enforcement doesn’t like them, but they’re a handy gadget for every day drivers to avoid speeding tickets. Now, since there are many radar detectors on the market, we’ve gathered our top picks to help you find the best option. The best part? They’re all under $100! These Cobra and Whistler models give the best bounce for ounce. These radar detectors may be under $100 but they provide 3600 detection with a good range. They include detection of the most common radars up to the more advanced ones. Each radar detector, also features city/highway modes to avoid false-positive alerts. Our detailed review of each follows to give you an idea which one best fit your preference/need. The Cobra ESD 7570 may be a basic and simple budget radar detector but is effective in detecting all recognized laser and radar frequencies. More than that, it has built-in safety alerts for railroad crossings, emergency automobiles, and any road hazards, which keep drivers vigilant and safe. Additionally, drivers are made aware of proximity to radars with its on-board signal strength indicator. It also reduces false alerts through its city/highway mode options. 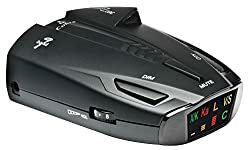 As for dodging law enforcement with radar detector-detectors, the Cobra ESD 7570 is also designed with cloaking features . It’s undetectable to both Spectre-I and VG-2 tools. While not as high performing as expensive radars the Cobra ESD 7570 has saved many users many times. It feels sturdy despite being a budget option and includes extra features for safety too. This radar detector is definitely worth the spend. The Whistler CR75 comes close to our top pick also providing 3600 detection against known frequencies and their bands. This includes x, K, Ka and Laser. This high-performance radar detector just costs more than the ESD7570 but does come with added features. This includes an Alert Priority feature that identifies the most relevant alert to your location out of all other signals detected. The CR75 also VG-2 undetectable for added security against radar detector-detectors. 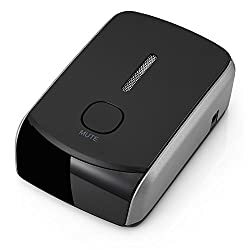 This would eliminate detection of your radar detector for areas where this type of electronics is prohibited. To add to that, false-positive alerts are also minimized through its Highway/City mode options. And While you can silence alerts in silence mode, its LED blinking light provides a visual notification for any threat. Moreover, your vehicle has a blanketed protection with a front, side and rear coverage. Then its digital compass provides 5o – increment view of your direction. To top all that, it also has Traffic Flow Signal Rejection (TFSR) that can evade traffic flow sensors. It has good detection but tends to have a lot of false alerts in some locations. The CR75 has a good range and stellar performance in detection. Many city drivers also appreciate its Alert Priority feature and find it helpful in roads that have multiple signals. Though pricier than our top pick, its extra features make it another good option. If you’re the type who’s more comfortable with voice or audio notifications, the Whistler Pro-78SE is the best radar for you. This high-performance radar provides a boosted range with 3600 protection against all recognized radar bands and lasers. As it identifies threats, you get real voice alerts on active radars without diverting your attention from the road. Meanwhile, the voice alerts also work as a safety warning system minimizing the need for the driver to touch or view the detector. The Pro-78SE also comes with city/highway mode options that allow you to adjust the radar’s sensitive to minimize false alerts. This means, you can adjust this according to your current location. Finally, for added convenience, its Intellicord accessory provides remote control of the device including the on/off switch. Most complains are due to defective units that either resets randomly or is overly sensitive giving too many false alerts. For a price tag under $50 and a stellar performance, the Pro-78SE makes a good buy for a radar detector. Moreover, it best suits users who rely more on audio/voice alerts while driving. The best in detection speed, the Cobra RAD350 radar’s “instant on” protection makes it the best choice against threats. This feature lets it detect radars faster than any other budget detectors. Moreover, it has IVT (In-Vehicle Technology) that reduces false alerts from electronics that can trigger false flags. These include vehicle collision avoidance systems and traffic flow monitoring devices. With the RAD350 you can dodge all recognized radar bands (X,K and Ka)as well as laser and VG-2 signals. To add to these speedy detection features, it also has quiet alerts, auto dimming and a digital strength meter. The latter gives you a heads-up against speeding detectors and radars since you will see your range from them. Meanwhile, when it comes to visible alerts, its 7-segment color display is easily visible in both nighttime and daytime conditions. The icons are intuitive and easy to read, so you easily determine which signals are available in the area. A few customers have difficulty with the alert audio level. If you tend to travel in higher speeds often you need a radar that can work as fast. The Cobra RAD350 is the perfect fit for drivers who need fast detection speeds. Plus, more than speed you also get other useful features with the package. The Whistler XTR265 is almost the size of your mobile phone but is packed with a complete feature set. It provides a 3600 protection from all known radar and laser signals. Moreover, this Whistler comes with POP mode safety alerts plus a safety warning system that warns the driver of dangers on the road in advance. Also impressive for its size and price, is the inclusion of cloaking against VG-2 technology, which helps you avoid detection. Unlike the Pro-78SE, this Whistler keeps you safe from law enforcement using this anti-radar detector tech. 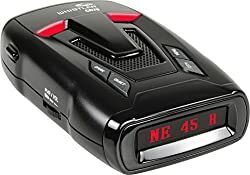 Like our other picks, this radar detector also features city/highway modes with two options for city mode. As you drive, you can opt to rely on visual alerts and display by choosing Quiet or auto quiet modes. Finally, it is also designed as a car battery saver. It conserves car battery life by shutting down automatically within 3 hours of turning off the vehicle. Some users find its accuracy failing in their areas, though may also be due to defective units. While there are some complaints about accuracy, the Whistler XTR265 has helped more users avoid speeding tickets than others. Many appreciate its compact and wireless design and how easy it is to set up too. While it may not have the boosted range like that of the Pro-78SE, it does a good enough job in coverage. Plus, having some cloaking tech helps avoid anti-radar detector tech. If you prefer managing devices through your mobile Android or iOS device, you’ll like the Cobra Electronics iRad 950. Unlike most budget radar detectors, it works with the iRadar app that provides added features like a “get directions” mode and live traffic data. These help you navigate to your destination easier. Additionally, a community empowered coverage map provides up to 40,000 reports daily. That’s in addition to red light camera alerts, user reporting, speed cameras, live police locations, and real-time traffic data. These also provide notices for caution areas and traffic jams you can avoid. Detection wise, it provides a solid 3600 protection from recognized radar and laser brands. It can identify threats as far as a quarter of a mile in distance. Some users find it gets a lot of false alerts in their city. However, better knowledge of controlling this through the app would help solve this. Some concerns with false alerts for city driving due to collision warning and cruise control features. Its app and compact Cobra iRadar ATOM makes it a powerful radar detector and travel gadget. The app provides the opportunity for more enhancements and allows a more controlled experience with the app. Over-all, for what it offers for its price and compact size, it’s an impressive gadget to have. With Cobra’s super-fast sweet circuitry, even the fastest radar guns get detected by the XRS 9370. Users receive voice and audio notifications in advance of the threat so they can stay clear of them. It covers all 14 recognized radar and laser frequencies. Moreover, the XRS 9370 has cloaking technology against VG-2 and Spectre-I making it undetectable to anti-radar tech. This radar detector helps you avoid a ticket with 3600 detection. This detector is also built with Ku band detection for any future use of the tech in the US. Plus, for convenience and easier use, it has options for auto-dim (to adjust to nighttime use)and auto-mute. Finally, to reduce false-alerts it has city/highway modes and a signal strength meter to provide distance range to identified radars. Some users struggle to control false alerts in city mode. 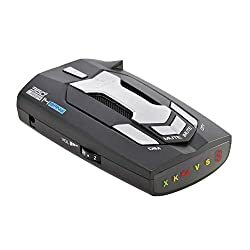 The XRS 9370 provides good protection against radar detectors at a good speed. It has a full feature set that is useful for drivers and comes at a fair price. Plus, it offers some future-proofing with its Ku band detection. The Cobra XRS 9470 is designed with 3600 degree protection, detecting signals from both front and rear of your vehicle. It detects 7 radar signals, 6 laser signals and 1 safety signal. 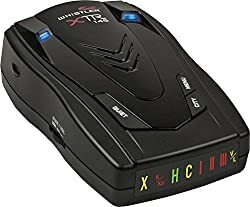 That, coupled with VG2 and Spectre alert technology makes it an excellent extra defense against radar detector-detectors. While the Cobra XRS 9470 shines in range, it also comes with city/highway modes, eliminating false positives from signal detection. Altogether, these features help you avoid law enforcement vehicles from to 1.2KM away. This means drivers get enough time to prepare and reduce speed along the way. In addition to these features, the Cobra XRS 9470 also has auto-mute, auto-dim and safety alerts for road hazards and railroad crossing. Some users experience a lot of false positives, which should be resolved with proper use of modes. The Cobra XRS 9470 provides up to 1.2KM of head start in detection making it our best in range. This gives drivers a lot of time to adjust accordingly and evade speeding radars. In addition to good range and detection, it comes with a good feature set for added safety and convenience. A budget radar detector with a super wide range? We’ve got one for you. The SPX 900 by Cobra may be cheap but it comes with an impressive feature set for its price. Like the XRS 9370, this Cobra is also equipped with super-fast sweep circuitry for extra fast detection. It covers 3600 detection of 7 radar signals,6 laser signals and 1 safety signal. 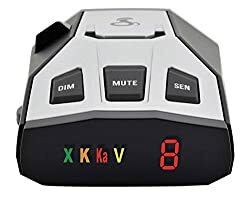 Moreover, this radar detector has cloaking tech and can evade VG-2 and Spectre-I radar-detector detectors. It’s also fast enough to avoid the latest Radar Gun POP with its POP mode. Finally, for reduced false alerts, it comes with city/highway modes. Overall, It’s fairly similar to the XRS 9370 except it doesn’t have Ku detection and a signal strength meter. Although it has many positive reviews, there are a few who had concerns with accuracy. Seems to have failed detection of radar guns based on feedback. For much less than the price of the Cobra XRS 9370, the SPX 900 comes very close in feature set and performance. It detects with a good 3600 range against recognized radar bands as well as cloaking against anti-radar detection tech. Trying to avoid speeding tickets from law enforcement doesn’t mean having to spend so much. With these top picks under $100, you get fair protection against all known bands with some even offering helpful safety features. Then when it comes to sensitivity, options for highway/city driving reduce the number of false-positive alerts. Overall, the Cobra ESD 7570 provides the best feature set for the best price when it comes to radar detectors. It is effective in identifying threats at a good range while also protects users against radar-detector detectors. Moreover, its added safety features and signal strength indicator provide added protection.